Industrial vacuum cleaning system designed to clean 100% liquids, or liquids with solid particles such as metal chips or shavings. Operators quickly empty machine tool sumps, machining beds, oil/water separators, parts washers, rinse tanks, and efficiently clean-up liquid spills. Solid particles are separated from collected liquid with a VAC-U-MAX Chip Basket and liner. System cleans up to 1-2 gallons per second (60-120 GPM) and with the turn of a lever the 55MW pumps out the liquid contents in the drum through a discharge hose, and into a central filtration system for coolant/oils or approved floor drain. Separating coolant and chips in one step enables less down time, improves scrap handling, and recycles coolant - extending coolant life and prevents chips/swarf from clogging machine tool filtration systems. Industrial Vacuum Cleaning System designed specifically for high volume recovery (up to 5 tons per hour) of even the heaviest materials. System features a powerful positive displacement pump and is available in either 10 or 15 HP. As a continuous-duty vacuum producer, system meets even the toughest clean-up challenges, and comes equipped with a secondary cartridge filter, vacuum relief valve, and 40-gallon collection container. Unit is easily maneuvered by a single operator. Noise levels are below OSHA standard. Excellent choice for steel shot/grit, cast iron chips, and waterjet sludge, etc. VAC-U-MAX Model TK is ideal for applications requiring high volume liquid recovery, with wet and dry options available as application dictates. Unique design fills 99% of closed top drums at rates of up to 2 gallons per second. Unit features a single venturi, producing maximum suction and air-flow with minimum air consumption. The Model TK offers quiet operation with no motor noise and air exhaust muffled for sound levels within OSHA requirements. Transfer Tank Kit is available in carbon steel powder coat or stainless-steel bead blast finish. Typical applications include: parts washers, machine tool sumps, drum to drum transfer, sludge removal from finishing tanks, ink wells on printing presses, liquid spill cleaning including flammable liquids, hazardous liquids, spill kits, hydraulic fluids, transformer oil and wet dust collector sumps. Central vacuum cleaning systems designed with high-powered vacuum pumps and VAC-U-MAX’s unique Tube Hopper that collects and deposits chips onto existing below-floor mechanical chip conveyors. System is used to manually clean the inside of the machine tool and large parts that are being machined which have a lot of nooks and crannies for chips and coolant to build up inside. The Tube Hopper discharges the collected chips onto the mechanical chip conveyor which runs beneath the floor level. System is ideal for applications requiring the cleaning of all types of metal debris including cast iron, steel, aluminum and composite chips, wet or dry, and other abrasive materials with coolant. Unit offers mildew-resistant filters that provide clog-free collection of all chips that fit through the hose, reducing cleaning times and increasing uptime for expensive machine tools. 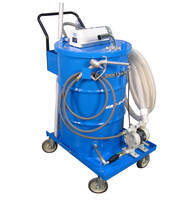 VAC-U-MAX’s full range of portable and central industrial vacuum cleaning systems, please visit www.vac-u-max.com/vacuum or email sales@vac-u-max.net. About VAC-U-MAX: VAC-U-MAX is a worldwide leader in process automation and industrial vacuum cleaning systems and solutions. Product range includes vacuum conveying systems for batching and weighing powders and bulk materials, mechanical and flexible screw conveying systems, and a full range of portable and central industrial vacuum cleaning systems for high volume recovery of bulk materials, combustible dusts, sludge, flammable liquids and separation of metals from liquids.